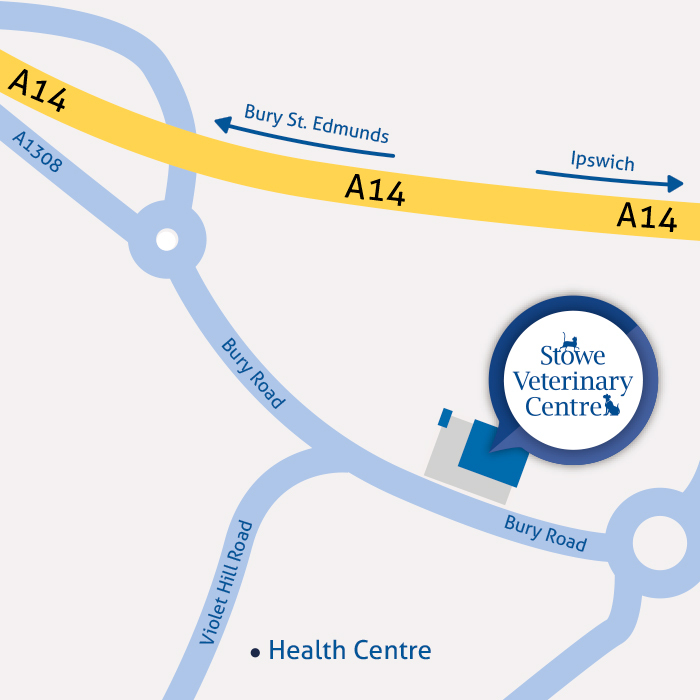 Stowe Veterinary Centre is located on Bury Road, Stowmarket, and is accessible from all directions. With free on-site car parking, the centre is conveniently placed and comfortable for clients as well as pets to visit. Take exit 49 signposted Haughley/Wetherden/Stowmarket. At the roundabout, take the second exit signposted A1308/Tot Hill. Follow the road and, at the next roundabout, take the first exit onto Bury Road. We are just a little way down the road on the left. Take exit 49 signposted Haughley/Wetherden/Stowmarket. At the roundabout, take the second exit onto the A1308. At the next roundabout, take the second exit onto Tot Hill/A1308. Follow the road and, at the third roundabout, take the first exit onto Bury Road. We are just a little way down on the left.